During the project period, in DPEP-III the construction of block resources centres, building for new and building less / reconstruction of primary schools, additional classrooms were taking existing schools were repined, drinking water and toilet facilities were provided. While in SSA the upper primary school buildings were also taken up. The most significant aspect of uncivil work programme is involvement of this community and inclusion of innovation designs and child friendly elements in civil works. Plinth Area : 122.00 Sq Mtr. Cost : Rs. 1565.57/Sq Mtr. Use of Locally available stone slab in roof. Plinth Area : 116.21 Sq Mtr. Cost : Rs. 1643.57 /Sq Mtr. Plinth Area : 103.55 Sq Mtr. Cost : Rs. 1844.52 /Sq Mtr. Plinth Area : 166.00 Sq Mtr. Cost : Rs. 1646.55 /Sq Mtr. Plinth Area : 102.00 Sq Mtr. Cost : Rs. 1872.55 /Sq Mtr. 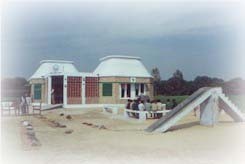 As per existing norms of Government of UP there should be a primary school for habitation having a population 300 and within a walking distance of 1.5 km, while as per revised norms of Government of UP the primary school should be for habitation having population of 300 and within a waling distance of 1 km. Habitation having a population of 800 and within a walking distance of 3 km. as per existing norm , while as per revised norms habitation having a population of 800 and within a walking distance of 2 km. 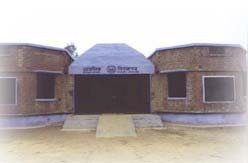 Primary School :1.91 lacs 40% of the unit cost is borne by project and the remaining 60% by through Rural development scheme of Pradhanmanri Gramadoyozna in DPEP programme. The revised unit cost for primary school is Rs. 2.44 lacs. In 2006-07 the earthquake resistance provisions has been made in Primary/ Upper Primary schoolbuildings upto zone 4. On the basis of revised design the manual for Primary school, Upper Primary school and class room has been prepared and provided to the districts. the earthquake resistance designs have been vetted by National Seismic Advisor, Ministry of Home Affairs, Goverment of India, New Delhi. The unit cost of Primary and Upper Primary school were revised. The revised cost of primary school building is Rs 2.64 lacs and upper primary school building is Rs 5.15 lacs. The additional class room designs are also upgraded by adding earthquake resistance provision as well as the parameter of classroom or by revising the plan-as ground floor/ first floor.The revised unit cost of additional class room is 1.40 lacs. wide G.O no 794/79-5-2006-129/98 T.C Shiksha Anubhag-5 dated 24 April 2006. 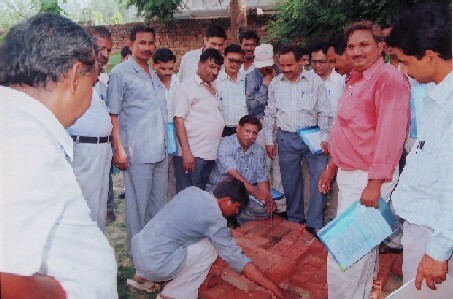 Two day training of 2 engineers of RES department and 2 ABSA from each districts had been given in earthquake resistance provision in school building at UP Academy of Management and Training (IMDUP) Aliganj, Lucknow in month of June 2006. these master trainers will trained the school teacher/ Rajmistree/ Pradhan the persons incharge for school building constructions.